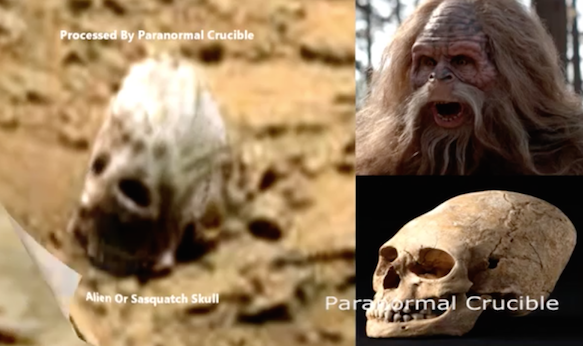 UFO SIGHTINGS DAILY: Alien Or Sasquatch Skull Found On Mars Near Rover June 2016, Video, UFO Sighting News. Alien Or Sasquatch Skull Found On Mars Near Rover June 2016, Video, UFO Sighting News. Paranormal Crucible found this. This is a strange, but cool discovery in the NASA rover archives. This object on the ground looks like an ancient skull of one of the alien species that once lived on the surface of Mars. The skull is big, about the same size as a human skull. I don't believe its a helmet. A helmet would not have a perfectly formed nose area. Also the two ridges along one side are similar to ridges along bones found on Earth. Strange artifact found by the rover, appears to resemble a large skull, obviously alien in nature, could it be the remains of a Sasquatch or a bizarre Martian creature?